Hot enough for you? Try cooling off with books and movies set in cold climes and cold countries. This week some of our blogging librarians recommend their favorite reads for cooling off. 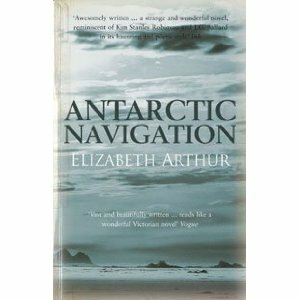 Set on the coldest continent – high temperatures in Antarctica rarely get above freezing – Elizabeth Arthur’s lyrical Antarctic Navigation is a heady mix of history, anthropology, environmental responsibility, science, human relationships and feminism all packed into one weighty tome. It’s also the adventure story of a lifetime. Long fascinated by the lure of Antarctica, Morgan Lamont decides to bring attention the careless destruction of the environment by recreating the Robert Scott’s failed 1910 expedition to the South Pole. She assembles a talented team of scientists and researchers, outfits them with gear and equipment (including sled dogs) and researches Scott’s route and experiences. Even the best laid plans, however, can’t prepare Morgan for the human interactions and entanglements; when tragedy strikes these loyalties and ties are put to the test under the most difficult conditions imaginable. In addition to the fascinating details of exactly how much work and planning is required to undertake such a mission, there is a lot of reflection on Scott’s historic trip. Scott is considered a hero, especially in England, despite the fact that he failed to be the first to reach the South Pole and ultimately died within a days walk of home camp. His bravery and his dedication to doing the right thing created an iconic figure, something that Morgan examines and tests in her own expedition. It’s not all philosophy though – there are nail-biting action sequences and many interesting characters in the team Morgan assembles. Throughout the book, however, the real star is Antarctica herself – fascinating, distant, ferocious and beautiful, a a haunting land of dreams and sorrows.